We offer online booking for your convenience with no booking fee or charges. If you have any questions please call the golf shop at 301.314.4653. View our calendar to check the availability of the golf course and any upcoming events you may be interested in. 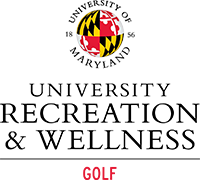 Stay up to date on the latest events, specials and news at the UMD Golf Course! Rate your experience at the UMD Golf Course and you'll be entered to win a free round of golf. The University of Maryland is the hub of our state's higher education system. Many of the members and patrons are alumni, faculty, staff and students who view the golf course as the University community's premier recreational venue.